Are you using drones in your line of work? You have to agree with us that they make the job much easier and a lot more fun than before, right? But, is your current model outdated or perhaps it simply doesn’t have features that you need to get your job done? Are you looking for a more advanced model? You are in the right place as we are about to present to you the most expensive drones on the market that are purely made for professionals. Not only that the most expensive ones come with a plethora of useful features, but they are also much easier to use, can perform most of the task autonomously, and are usually more durable than the cheaper models. However, finding the one that suits all your personal needs can be a mission impossible because there are so many different models on the market. We understand that looking for the ideal model demands plenty of time and nerve wrecking research. That is exactly why we decided to make it easier for you, and make sure that the model you are buying is the right one. In this article, you will first get an insight into what are the things you need to pay attention before you actually buy a certain model, and then, when you know what to look for and what to keep an eye on, you will have a chance to read reviews of the top 8 models on the market. Also, we will offer you suggestions on the related products that will definitely come in handy with the drone model you chose, as well as list the Pros and Cons for each model. Now, let’s begin! This might be the most important feature that you should keep an eye on. If a drone is complicated to use and takes too much time to set it up as well as to get all the buttons and sensors checked before you take off or too complicated to control once it’s in the air, then you should keep on searching. You’ll never get used to it, believe us. And this can result in a crash and simply wasting money. What you need to check first is how fast can you get it in the air once you found the spot you want to take off from. If the model you are checking out can be ready to take off in under 5 minutes, then it’s worth considering. Also, if it does all the pre-flight check ups and connection procedure on its own, you will save plenty of time. Furthermore, you will avoid the possibility of forgetting something and taking off with a drone that is not ready to fly. Lastly, once it’s in the air, what you don’t need is to press too many buttons to set the route or camera modes, while controlling the drone at the same time. Look for models that have user friendly interface that is not too complicated and easy to use even while having your thumbs on the sticks. Also, the gimbal pitch control should be easy to reach and control with your other fingers as that will allow you to fly the drone and control the camera angle at the same time. Another extremely important feature is the performance while in the air. 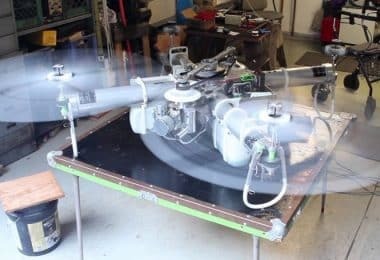 A drone can have amazing specs on paper, from strong motors, large props, to stabilization and safety systems, but all that can mean nothing if all those systems and parts are not working in perfect correlation. Sometimes, manufacturers test their models without the additional equipment like the gimbals and the cameras, and when you add that additional weight and move the center of gravity, the drone will not be as reliable and stable as without any equipment. Plus, additional gear will significantly reduce flight times. Therefore, you need to do the research, check the reviews, and find out how a certain model handles “heavy load”. 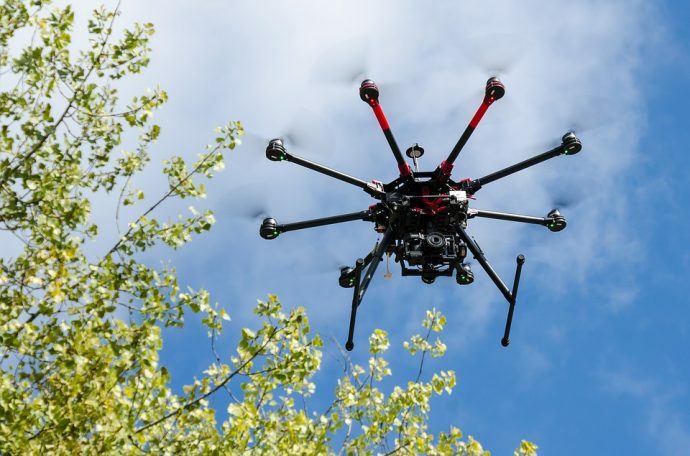 Another thing to be careful about is the GPS signal and if the drone you plan on buying is not infamous for losing the connection with the satellites as that might make the drone loose the orientation and flying away on its own. Aerodynamics is another important thing to have in mind, especially if you plan on using your drone in windy areas. It needs to be able to not get thrown out of balance if a sudden gust of winds hits it from the side. If you are considering getting a racing drone, then the range isn’t that important as most of these types of drones have a range between 300 to 500 meters. However, since you are here, we are pretty sure that the model you are looking for is meant for other purposes such as aerial filming and photography. In this case, having a long range is very important. For aerial filmography, being able to cover distances of a few kilometers is very important as it allows you to have those breathtaking, slow, panoramic flyby shots, which is one of the main purpose of camera drones. This especially goes for the height range. Also, if the range is just some 100 or 200 meters, you will be visible practically in every shot and that is pretty much useless. 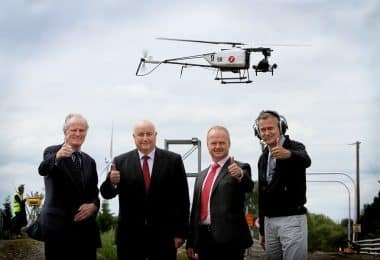 Another benefit of having a long range is that, if you want to do land survey or some kind of aerial inspections such as crop assessment, or search and rescue operations, with a range of some 2 or 3 or even more kilometers, you will cover a much bigger area and get the job done much easier and faster. What good are all the fancy modes, flight assist systems, and high-end cameras with stabilization and breathtaking footage if your drone can stay in the air for just 5 minutes? You can’t get anything done in such short time, right? Flight time depends on many factors such as the total weight of the drone with all the additional equipment included, the power of the motors, the size of the props, battery capacity, and weather conditions. The lighter the drone, the longer it will stay in the air, simple as that. But, what use is a drone if it can only fly and not carry a camera and a gimbal? Luckily, most of the models we reviewed here are “heavy lifters” and come with some of the longest flight times on the market, with all the additional equipment mounted on them. 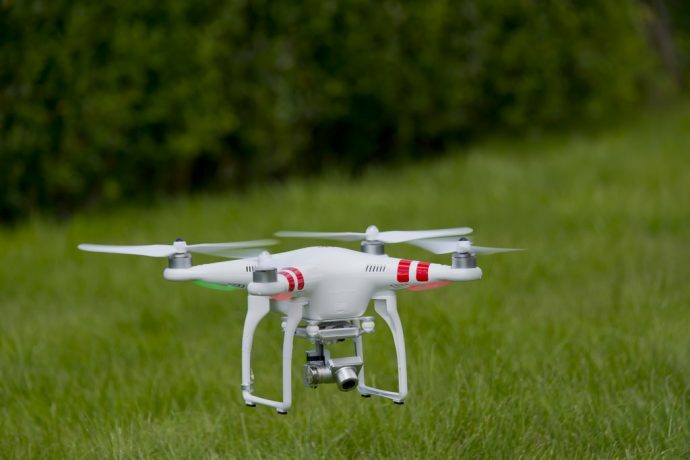 Before you buy a drone, you need to realize that having a drone is just like having a car. It needs servicing and some parts are expendable and need to be changed after a while. Now, depending on the model, the cost of regular maintenance can go from under $100 every few months, to up to a $1K. The higher the price of a model, the higher the maintenance bill will be. Therefore, before deciding which model to buy, you also need to check the prices of spare parts such as batteries, props, compass, GPS module, motors, landing gear, as these are the parts that tend to be the ones that get replaced the most. Also, you need to check the service costs as you won’t be able to replace all the parts yourself, and you will need to send the drone to official repair centers and that can get pretty costly. 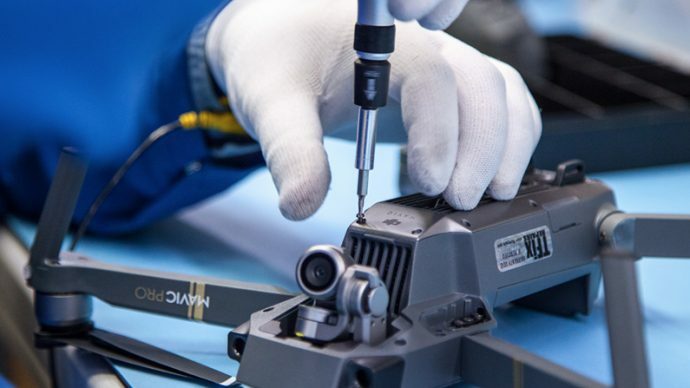 As we just mentioned, servicing your drone can be quite expensive, but for some parts such as props and batteries, or landing gear and gimbals, in case they get damaged or simply need to be replaced with new parts, you won’t always need to send it to an official service. You can pretty much do it on your own and pay just for the parts. However, before you choose a model, you also need to check if the spare parts are easily available and if their prices suit your budget. Keep in mind that for some models, a simple, spare part like a prop, can cost up to $100, not to mention the batteries which can go up to a few hundred dollars. So, try to find a model that suits your needs, but also has spare parts that are not that expensive and are easy to find. Now, we have come to the most important part of our article, the model reviews. We have carefully selected the top 8 high-end models and if you plan to shoot jaw dropping aerial footage, do some area research or land surveying, or maybe you want to use it for search and rescue missions, at least one of our picks will get the job done perfectly. Description: The Freefly Systems ALTA Hexacopter is a model that comes with a unique design approach. First of all, it comes with a revolutionary arm design. The arms are made of curved carbon fiber tubes, that besides being really lightweight, offer the possibility of having 2 gimbal mounting points without sacrificing the camera’s field of view. Secondly, the drone itself is highly portable and practical due to the fact that it can be folded for a much comfortable transport, and it can be set up from completely folded to ready to fly in under 5 minutes. This drone offers filmmakers something that no other drone has, to film with the camera pointed up. Before this drone, all other drones were only capable of filming either with the camera being pointed forward, or downward. It will save you money on renting planes for those midair action sequences. When it comes to performance in the air, this model cannot be ranked among those that can withstand stronger winds. It is rather heavy in “movie mode”, thus keeping it balanced and responsive, while being hit by stronger winds, might be difficult as you might end up loosing control and crashing it. Therefore, it is advisable to fly the drone in moderate to no wind areas. Speaking of mounted batteries, you can use the Alta 6 with either one, if the payload is lighter (Black Magic Pocket camera + gimbal), or two parallel 6S/22.2 V batteries, if you plan on using a DSLR camera and the gimbal. In the first case, with a lighter camera and 1 battery, you will get some 20 minutes of flight time. But, by adding the second battery and keeping the same payload, the flight time can jump up to some 45 minutes, depending on the weather conditions. Related: If you plan to use this drone for filmmaking, you will definitely need the compatible gimbal that can stabilize the proper filming equipment. 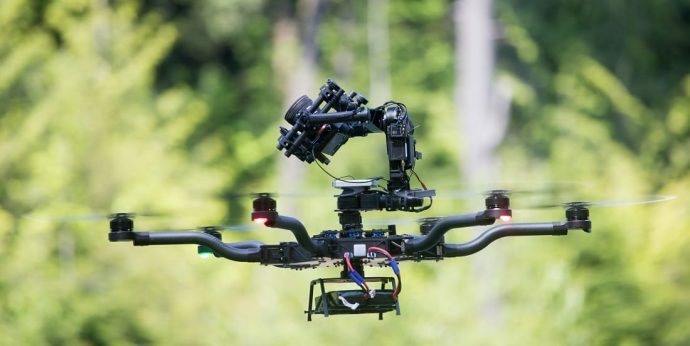 The compatible gimbal with this hexacopter is the same brand’s Movi M5 Stabilization System. 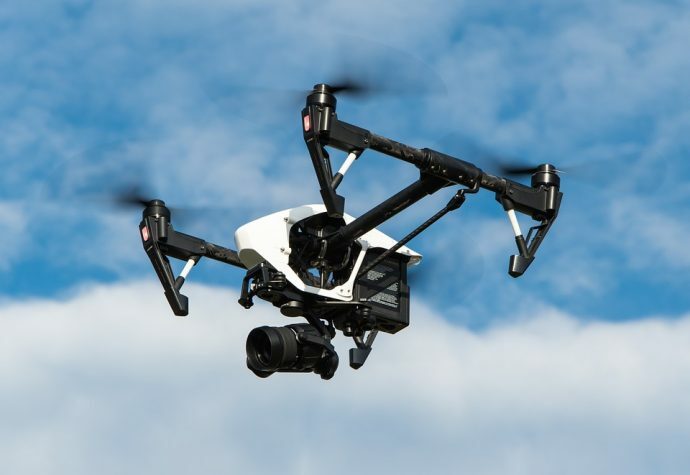 It comes with all the additional equipment that will allow to use it both on the top of the drone, for unique drone filming angles, and it can be mounted on the bottom of the drone, for standard drone aerial shots. And, you get a separate gimbal controller so that the camera operator can work on his own. 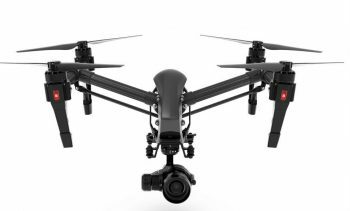 Description: The DJI Inspire 1 Pro Black Edition Quadcopter is the filmmaker’s dream come true. With its Micro 4/3 CMOS sensor and a f/1.7 15 mm lens, it is fully capable of shooting in 4K resolution, and the integrated gimbal system delivers smooth footage. It comes with its famous retractable arm system, where the motor arms act as a landing gear and lower down when the drone needs to land. While in the air, the arms tilt up and out of the camera’s way, allowing a 360° unobstructed view. The Zenmuse 3-axis gimbal will make the videos smooth, and allow the camera operator to pan the camera in any direction. It also has a slot for memory cards, both Micro SDHC and SDXC, but and is capable of streaming live 720p camera feed to the controller, which uses HDMI port to send the live feed either to FPV goggles, a tablet, monitor, or a smartphone with the DJI Inspire 1 app installed. 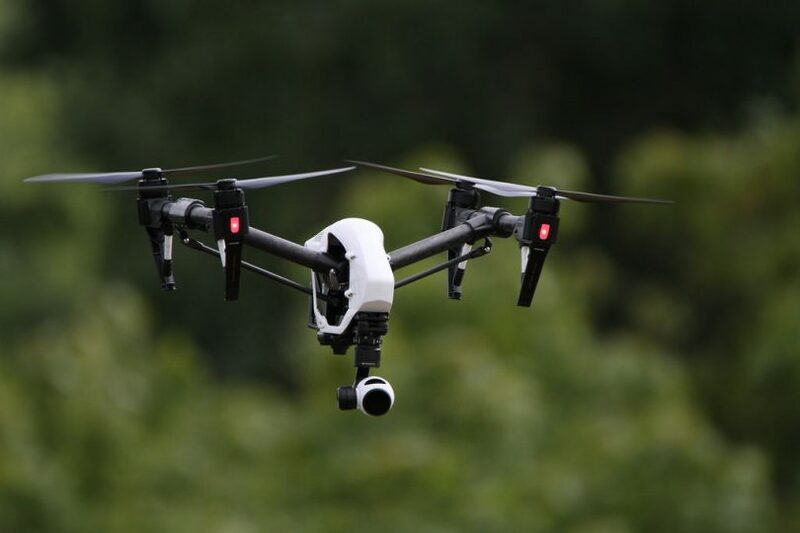 As for the transmitter, the standard package comes with one, but you can opt for two controllers so that either you or someone else, can operate the camera while the other one pilots the drone. When it comes to the stability, it’s one of the finest models. It relies a stabilization system that is based on GPS, but thanks to its one of a kind surroundings awareness, the Inspire 1 Pro is “holding its ground” even in strong winds. 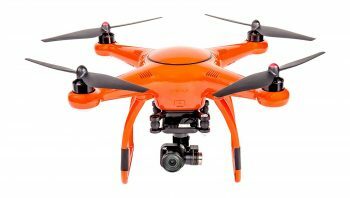 It also has a Vision Position system, that represents a combination of ultrasonic and optical flow sensors, which allow you to use the drone even indoors, without the GPS stabilization. As for useful semi autonomous modes, it comes with modes such as Follow Me, Waypoints, Course Lock, Home Lock, and the Dynamic Home Point. Related: Having extra batteries is never a bad idea. Therefore, we suggest you also buy the additional DJI TB48 Intelligent Batteries and the DJI Inspire 1 Battery Charging Hub that is capable of charging 4 batteries at once. 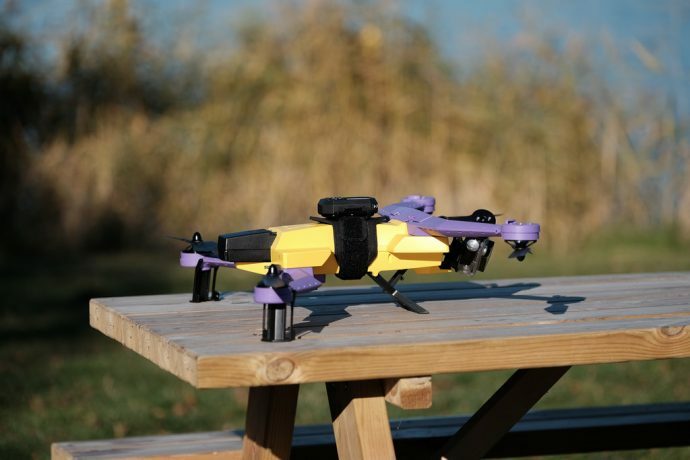 Description: The AirDog Drone has a unique design that separates it from the crowd. It is a foldable model that can easily be put in a backpack. However, unlike most foldable quadcopters that are small in size so that they could be compact and highly portable, the AirDog is not your average selfie drone, not by a long shot! When unfolded it is bigger than any of the Phantoms or the Mavic, but when the arms are folded, it can comfortably fit an average backpack, together with its “controller”. We deliberately wrote “controller” as the air dog doesn’t actually come with a standard radio controller like all other drones, nor is it controlled by an app in your smartphone. It actually comes with a waterproof car-keychain-alarm-looking thingy called the AirLeash, which serves as a beacon that keeps the drone focused on you all the time. It also has take-off and land buttons, and a few more buttons that help you choose the autonomous flight modes that were specifically designed to recognize the sport it films, so that it can adjust the speed, height, angles and plenty other parameters for a mistake free frame with you in the middle all the time. When it comes to flight time, a lot of action can be filmed during the 15 minutes it can stay in the air on one battery charge. However, even though this really is an amazing drone model and it comes with some impressive set of features, we think that the price of some $1300 is not justified, especially since it doesn’t come with its own camera, and you have to additionally buy a GoPro Hero 3 or higher. Also, the gimbal is sold separately, so one more additional cost if you want great action sports videos. Related: Since this drone doesn’t come with a camera of its own, you should get the latest one its compatible with, the GoPro Hero 5 Action Cam. Also, you will need the gimbal if you want to have smooth leveled footage. Therefore, we recommend checking out the AirDog Gimbal. 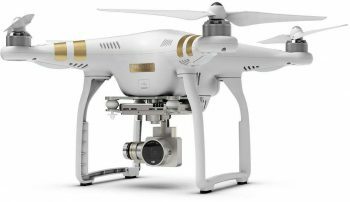 Description: The DJI Phantom 3 Pro Quadcopter is as easy to fly as its older relative the P2 Vision+. You will get comfortable with it in a wide field open area even after just one battery run, that’s how beginner friendly this model is. The drone itself responds to your control inputs unbelievably fast, and it decelerates quickly, allowing you to avoid crashing it into trees or walls by simply pulling the stick in the opposite direction or leaving it in the neutral position. Furthermore, the P3 Pro also comes with Vision Positioning sensors at its the bottom, which stabilize the drone and allow error free hovering by detecting patterns on the surface below it, which is extremely useful if you want to fly the drone indoors, without using the GPS stabilizing system. However, the highlight of this model is its camera that is capable of shooting in 4K resolution. The P3 Pro’s footage delivers plenty of detail when you are looking at it on a 1080p or 4K display. But, the biggest advantage of the 4K resolution, is the possibility of cropping the footage without loosing the 1080p quality. As for the camera’s lens, the P3 Pro footage will come with a 90-degree FOV, which is actually much better than 110 or higher as you don’t have the distorted edges and the footage looks much more natural. This is especially useful if you plan on using the drone for professional purposes. The bottom line? The P3 Pro is really easy to set up and even easier to fly. This makes it a perfect tool for those who don’t have much experience with drone piloting, but need one for their business, such as real estate videography and photography, or sport enthusiasts that want jaw dropping footage of their adrenaline filled sessions. Related: Since this drone films in 4K, you will need as much memory cards as possible as such resolution takes plenty of memory. Therefore, we recommend getting the SanDisk Ultra 64GB microSDXC UHS-I Card. Another smart investment would be the Case Club Waterproof DJI Phantom 3 Drone Wheeled Case. It will keep your drone safe until you get to your take off spot, and beside the room for the drone, controller, spare props, and other parts, it allows you to take up to 7 batteries as well. Description: The Autel Robotics X-Star Premium Drone comes from a company that doesn’t have a famous name like, for example, DJI or Yuneec, but their 4K drone is definitely interesting. And, this model is becoming more and more popular among drone pilots that are looking for a decent quality, affordable price, and a nice set of features in one robust package. Furthermore, this drone comes with its own 4K camera and gimbal, and we can’t say that for all the models on our list. Sure, the Phantoms (3 and 4 series at least), and the Yuneec Typhoon, also come with a 4K camera, but the X-Star is around $100 cheaper than the P3 Pro, and a few hundreds from the P4. So, we think that the price of this model is more than affordable, especially since it actually offers high-quality footage, autonomous flight modes such as orbit, follow, and GPS/GLONASS positioning system for a stable and reliable flight. When it comes to the quality of the footage, you can expect impressive video and photo specs as the camera is capable of taking 12 MP photos that are crystal clear and with vivid colors, while the video footage can be shot in 4K at 30 fps, 2.7K at 60 fps, 1080p at 120 fps, and up to 240 fps in 720p. The frame rate for 1080p and 720p are especially good if you want to make slow motion videos. Also, the 3-axis gimbal this drone offers is easy to install or remove and it can be done in a matter of seconds. Furthermore, the X-Star comes with a user friendly remote controller system that offers a live HD camera feed, up to 1.2 miles from the controller. Related: Until you get comfortable with your new drone, we recommend using the Autel Robotics Propeller Guards, as they will keep your props from breaking in case of an impact. Also, a spare battery is always good to have as it allows you prolonged flight time. Therefore, we suggest checking out the Autel Robotics Battery. 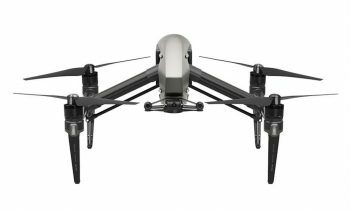 Description: The DJI Inspire 2 Professional Film Drone is nothing short of spectacular. Even though this drone only has 4 motors, its stability is unbelievable. However, we also have to say that this model needs to be registered with the FAA as its weight is around 7.3 lbs, and that is without the camera. At the first look, you will notice how its landing gear (motor arms) blocks the camera side views, but as soon as the drone goes up, the motor arms tilt upward, freeing up the camera view in all directions, for an unobstructed 360-degree view. Speaking of the motor arms, they are the same carbon fiber construction like the Inspire 1, but the body of the drone is another story. The Inspire 2 has a more durable magnesium alloy body, while the Inspire 1 comes with a plastic shell. However, this newer model doesn’t include camera. 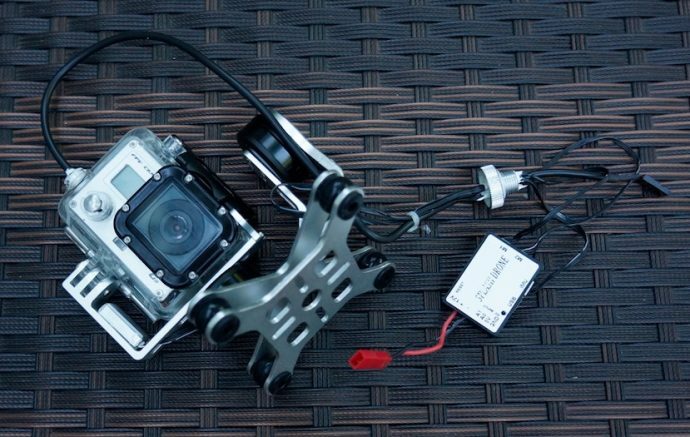 It actually comes with a FPV style, fixed front camera that serves only the pilot for FPV flying. If you want a camera for making breathtaking footage, you can choose between the Zenmuse X4S and X5S. The first option comes with the identical 20 MP, 1-inch sensor, and a mechanical shutter and a f/2.8-11 24 mm lens. On the other hand, the Zenmuse X5S, is a masterpiece when it comes to drone cameras. It supports lens swapping, and is capable of shooting videos in 5.2K quality in CinemaDNG, while the photos can be shot at 20 MP in DNG and JPG format. Furthermore, it supports two controller usage, where the pilot can use one for flying the drone and having live HD preview from the FPV camera in the front, while the second remote offers the camera operator the control over camera movement and lens focusing. Related: Since this drone uses two batteries at once, you will need plenty of spare batteries. Therefore, we recommend checking out the DJI TB50 Intelligent Fligh Battery for Inspire 2. Also, the drone doesn’t come with a camera for filming (the one it has is only for pilot FPV), so you will need either the Zenmuse X4S, or the Zenmuse X5S if you plan on using the drone for serious filmmaking. 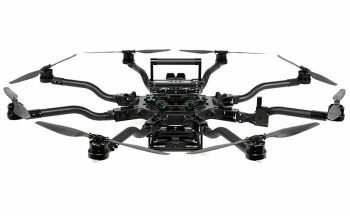 Description: The Freefly Syatems Alta 8 Octocopter is meant for those who want to use a drone for high end cinematography. In order to satisfy various production needs, this drone is capable of carrying a huge range of camera and lens combinations. For example, it can carry a Canon C300 Mark II, the Alexa Mini, or the Red Weapon camera. Filmmakers with a higher budget will definitely go for this model. Now, when it comes to flight characteristics, this drone is pretty stable, but not that safe to fly in windy conditions, due to its high weight with all the mounted filming equipment. Also, it doesn’t come with fancy autonomous flight modes like most of the models on our list, but then again, this is a tool for professional cinematographers who rely solely on their own skills. As for the flight time, like the Alta 6, it mostly depends on the mounted equipment, but the top you can expect is some 17 minutes. When it comes to cameras, as we mentioned above, this drone is capable of carrying a wide range of film cameras, but what separates it from the rest (except its 6 motor cousin), is the fact that it has two camera/gimbal mounting points. You can choose to, for example, mount a film camera on the top, and a smaller mirrorless camera on the bottom for footage various angles. Either way, with this drone, the entire drone aerial cinematography experience will reach a completely new level. Related: You are definitely going to need plenty of batteries for this drone as it is not a lightweight one. Therefore, we recommend getting the double package deal for the Floureon 6S 4500 mAh 22.5 V Batteries. 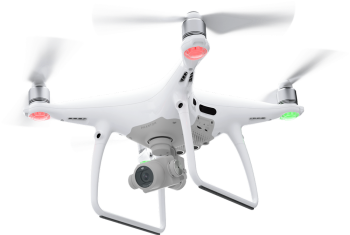 Description: The DJI Phantom 4 Pro Quadcopter doesn’t need any special introduction as every drone photography knows that this model is definitely a no-brainer. Not only that you get a drone that practically flies itself, you also get the possibility to make breathtaking photos from an aerial perspective, and shoot 4K videos of anything you want, even high-speed action like downhill skiing or car drifting. Not only that this model offers exceptional 4K footage quality, thanks to its Zenmuse X4S identical hardware, but you will also be able to shoot longer as it offers leading flight time of 27 minutes. That is mostly allowed due to the intelligent battery and overall system perfect correlation. Also, you don’t really have to worry that you will crash the drone as it comes with advanced collision avoidance systems. All in all, this is really a great camera drone model for everyone who is serious about getting into drone photography and videography business. It makes shooting videos unbelievably easy as it has the ability to recognize human faces, cars, animals, or you can simply mark an object you want it to focus on and it will keep it in the frame all the time. Of course, you can change the parameters such as distance from the object or the radius of the orbit, but still, there isn’t a drone on the market that makes high-quality drone filming as simple as the P4 Pro does. Related: If you want that cinema look in your videos, you definitely have to consider using camera filters. We recommend checking out the PolarPro DJI Phantom 4 Pro Cinema Series Filters. With the Phantom 4 Pro, we have reached the end of our article. Now, if you read carefully, you are definitely much more comfortable about choosing your high-end drone model, right? 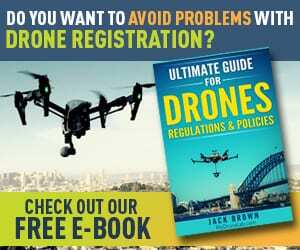 Now you know what to look for, what to avoid, and what to expect from your next drone. The only thing left is to focus on what you need the drone for, check all the reviews and study the features of each drone we presented here, and rest assured that the model you choose will serve all your needs. If you need something for serious cinematography, you should narrow your choices to one of the FreeFly Alta models, or one of the DJI Inspire drones. On the other hand, if you are here because you need a drone for real estate videos and photos, then the Phantom 3 will get the job done perfectly. For those adrenaline junkies who need action filled videos, the obvious choices are either the Phantom 4 or the AirDog. Whichever your choice is, just remember to follow the rules, fly safely, and have fun! Now, it’s your time to share thoughts. Which of these models did you like the most? Do you have some questions regarding that model? Or. 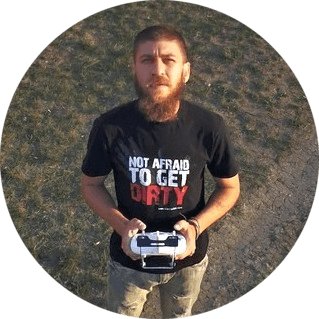 Do you want to share some of your drone experience with our readers? Feel free to visit the comments section below! Thanks for reading! 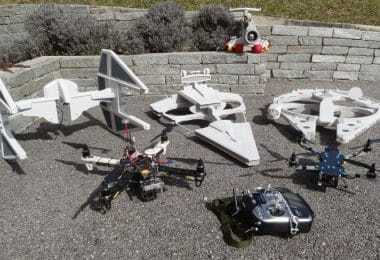 Best Quad Drones That Fit Everyone: Fly High With Your Drone Today!